1. 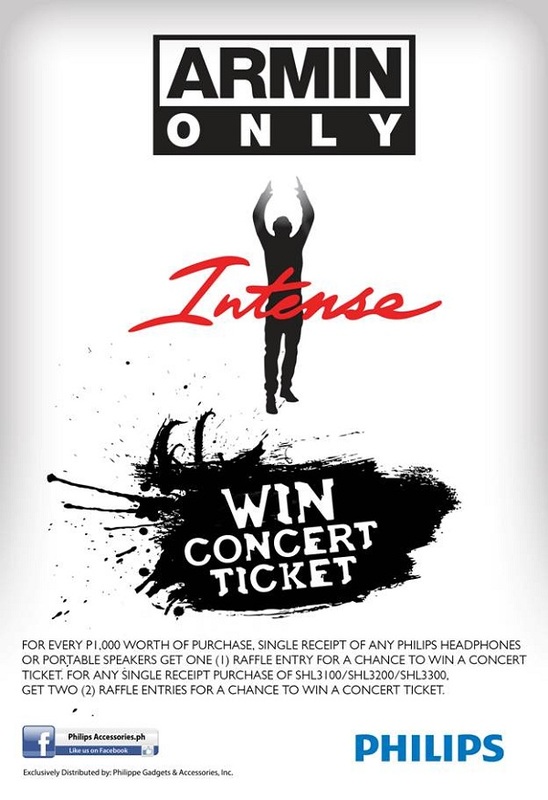 For a minimum PhP 1,000 worth of purchase, single receipt of any Philips Headphones or Portable Speakers from any participating Metro Manila branches, customer is entitled to one (1) raffle entry for the Philips “World of EDM” raffle promo from May 3 to May 25, 2014. 2. For every purchase of any Philips DJ Headphones (SHL3100 / SHL3200 / SHL3300) single receipt only, customer is entitled to two (2) raffle entries. 3. All Philips headphones and portable speakers are covered. 4. A PhP 1,000.00 minimum purchase is required. Scanned image of the Official Receipt (Invoice number indicated in the official receipt must match the invoice number encoded in the entry form. If not, said entry will be invalid). 6. An e-mail notification shall be sent confirming that the entry qualifies to the raffle. 7. Cut-off time for submission of raffle entries is until 11:59PM of May 25, 2014. 8. Ten (10) winners will be drawn for the following prizes via electronic raffle on May 26, 2014, 11:00AM at PGA Head Office located at 138 West Avenue, Quezon City. 9. Winners will be announced on the same day at Philips Accessories.ph Facebook fan page. 10. Winners will be notified via email and registered mail. 11. Winner must bring the proof of purchase (original copy of the official receipt/sales invoice), registered notification as proof of winning and and present at least two (2) valid IDs (School ID, Company ID, Driver’s License, SSS, GSIS, etc.) for the claiming of prizes. 12. Prize is not convertible to cash. 13. Participant cannot win more than once. 14. Employees of PGA, its advertising, promo and manpower agencies, and participating outlets including their relatives up to the second degree of consanguinity or affinity are disqualified from joining the promotion. 15. Promo runs from May 3 to May 25, 2014. 16. This promotion is not in conjunction with any Philips Headphones and Speakers promotion.